Mercedes GP Petronas has appointed Bob Bell as the new Technical Director effective April 1, 2011. Bell will report to Team Principal Ross Brawn and his role will primarily be based at the team’s factory in Brackley with overall responsibility for the technical operations of the chassis group. 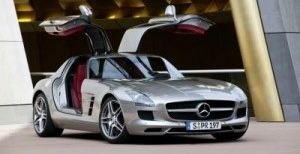 According to Daimler, Bob’s appointment will allow Ross Brawn greater freedom to oversee the full program between the team’s chassis group in Brackley and the engine group at Mercedes-Benz HighPerformanceEngines in Brixworth. Bell started his motorsport career as an aerodynamicist almost 30 years ago. He worked at McLaren, Benetton and Jordan, before becoming Deputy Technical Director at Renault in 2001. In 2003, Bell was promoted to Technical Director and played a key role in the team’s double championship-winning successes (2005 and 2006). While with Renault, he became the Acting Team Principal in September 2009 and Managing Director in 2010. Bell left Renault last year in October. I am both delighted and honored to be joining the MERCEDES GP PETRONAS Formula One Team as Technical Director. It will be a privilege to be a part of such a strong and determined organization, and to be able to contribute to furthering the enviable heritage of Mercedes-Benz in motorsport. We are delighted to welcome Bob to the MERCEDES GP PETRONAS team in the position of Technical Director. Bob’s appointment is a key step in the strengthening of our excellent technical team and we are pleased to have recruited one of the most experienced engineers in the sport. Bob will be an important asset to our team, bringing with him a wealth of Formula One knowledge and championship-winning experience, and we look forward to welcoming him at the start of April. Mercedes-Benz is fully committed to providing our Formula One team with the personnel and resources to compete at the forefront of the sport. Bob’s track record speaks for itself and I know he will be a valuable addition to our team as Technical Director. He shares our passion for competition and our vision for establishing long-term success with MERCEDES GP PETRONAS. 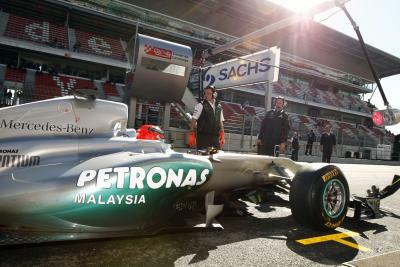 SOURCE Daimler/02-18-2011: Formula One’s third pre-season test began at the Circuit de Catalunya in Barcelona today with Michael Schumacher kicking off the program for the MERCEDES GP PETRONAS team. Nico Rosberg will take over the car on Saturday and Sunday, before Michael completes the four-day test on Monday. With the track damp from overnight rain and taking time to come up to speed, Michael first headed out midway through the morning to complete aerodynamic evaluations and balance checks. Following the lunch break, he completed a successful race simulation including pit stops. Michael completed 90 laps in total today. We had a good day and it is certainly satisfying to finish a race distance with all of the systems operational and to have everything working fine. Now we have to turn our focus to performance and it was important to complete today’s simulation to understand how the car and tires behave going from a heavy to lighter fuel load.